Which printing method should I use for my wedding invitations? If you have found yourself here, odds are that you have recently gotten engaged and are beginning to delve into the wonderful world of wedding planning. Welcome and congratulations! Seeing how you’re here, I imagine it might be time for you to get started on all things paper, and with that comes a few things you should know about the printing processes that come along with that. You might have heard some terms like “Letterpress” “Blind Deboss” or “Hot Foil Stamping” that may have left your scratching your head or nodding along with a mental note to google whatever the heck that is. If that’s the case, well you have come to the right place! I intend to break down the most popular printing styles used with wedding invitations so you can make an informed decision about which printing method (or methods) you like the best. First up is digital flat printing. This style of printing is by far the most popular and most commonly used. This is the process of taking an entire image and printing it digitally onto your desired paper. This can be done with ink (through ink jet printing) or toner (with laser printing). Most common household printers use digital flat printing. When printing for wedding invitations I partner with professional printers who use high quality commercial grade digital flat printers to ensure your paper and printing is always on point. Digital flat printing is the best method for printing intricate and colorful designs. You can print #allthecolors with digital flat printing and you can do so all at once, making this method not only pretty but efficient. Next up is the age old printing process of letterpress. This style of printing is essentially how printing got it’s start (Think Gutenberg). But you aren’t here for a history lesson so pardon me as I jump ahead to explain how it’s used today to make wedding invitations super spectacular. Letterpress printing uses a combination of a printing press to apply pressure, a custom plate (or die) of the design, ink that is hand mixed to match a chosen color swatch, and paper (usually a thick weight card stock). The Paper is loaded onto the press, usually one at a time, as the die is rolled with ink and stamped down onto the paper, leaving an impression of the design on the paper that you can see and feel. Because of the artisan process and the stunning impression left, this is a preferred printing method for elegant social affairs. Each color requires its own custom die to be made and for an additional run through on the press. This makes this printing process more costly than standard digital printing, especially when using multiple colors. Due to the intricate process, Letterpress requires more time for printing than standard digital printing, this is really only a con if you are in a hurry. My personal favorite printing process is hot foil stamping. I am a sucker for all things that sparkle. Hot foil stamping is quite similar to letterpress printing in that it involves a press to apply pressure and a custom plate (or die) to apply the design to paper. The main difference is that instead of using ink on the plate, it uses a foil film and a heated die to stamp the foil into place on the paper. The result is the same beautiful impression you have with letterpress, but this time with stunning metallic or matte foils instead of ink. The most common colors used are gold, silver, or copper. But you can even get blue, red, rose gold, holographic rainbow, and many many more! I also love to use Letterpress and Foil together in combination. This image here is black letterpress with gold foil text on a double thick paper stock. Truly a sight to see in person. Due to the labor intensive printing process, foil is more costly than other printing methods and takes a longer time. Be sure to allow space in your budget if you want to include foil as well as getting started early so you don’t run out of time. Another method that is also similar to Letterpress and Hot Foil Stamping is that of creating Blind Impressions. Embossing is the process of creating a raised impression onto paper and debossing is the processes of creating a depressed or sunken in impression onto paper. It is called a “blind” impression because no ink is used and it is intended only to create a tactile impression on the paper. Embossing alters the surface of paper by providing a three-dimensional or raised effect on selected areas. This method requires the use of two dies: one that is raised and one that is recessed. The dies fit into each other so that when the paper is pressed between them, the raised die forces the stock into the recessed die and creates the embossed impression. Debossing is similar to embossing, but recesses the design rather than raising it. Rather than the paper being raised in specific areas, it is indented. The process involves applying pressure to the front side of the paper and forcing it down from the surface. The image to the right shows a blind deboss impression of palm leaves. 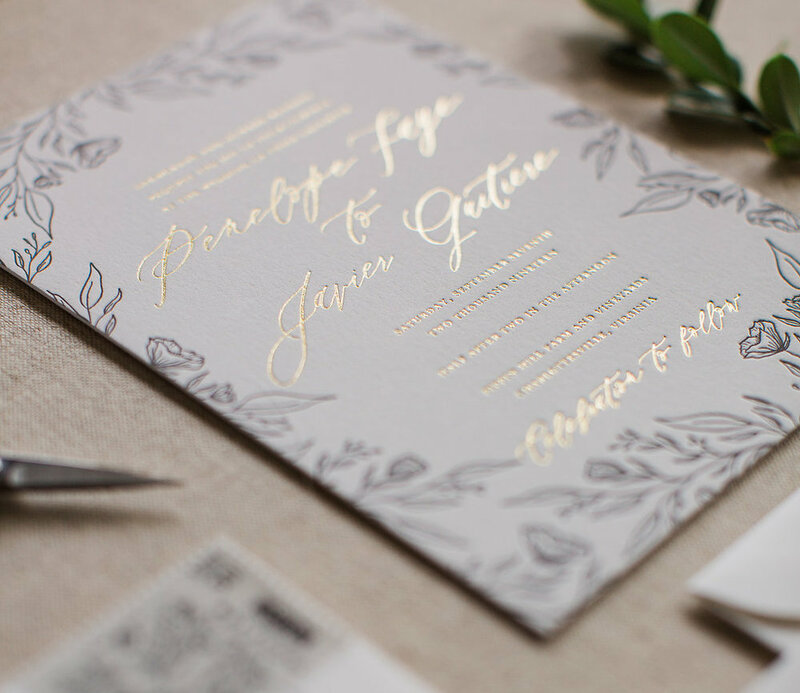 It is a little tricky to capture the true feel in photos, but in person it is a subtle way to add design to an invitation in an elegant and understated manner. Because of the use of multiple plates it tends to be more expensive than other print processes. One of my favorite things to do is to combine printing methods to let each method shine at what it does best. For example I love to combine digital flat printing with pops of gold hot foil stamping. This works best whenever I want to add some sparkle to one of my illustrated or watercolor designs. When I’m designing an invitation that uses line art (like in a botanical sketch or custom venue illustration) I love to use both letterpress and foil. Letterpress takes the line artwork to a whole other level while adding foil to the text adds that extra kick! While there are many other print methods out there, these are the most popular and most commonly used print methods when you work with me on creating your event stationery. If you have any questions about any of these print methods or other print methods you might have heard of but I didn’t cover here, send me an email at hello@featheredheartprints.com and we can chat about it in more detail.